Condition is Used. STRAIGHT TYPE AIR FILTER MOUNT. Used air filter housing for Land Rover 2.5 N/A diesel engined 90 and 110 models. Not suitable for turbo and TDi models. Some external surface corrosion and internal below filter. Complete with hose and used filter. Land Rover Discovery 1 Ait intake/filtet box from 300tdi model. 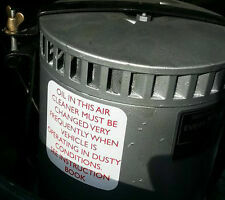 HERE WE HAVE A USED AIR FILTER / CLEANER BOX ASSEMBLY TO FIT A LAND ROVER DEFENDER TD5. DEFENDER AIR BOX. ULTING 4X4 LAND ROVER PARTS. LAND ROVER PART NUMBER ESR1050. LAND ROVER DISCOVERY 200TDI AIR FILTER HOUSING. THERE ARE TWO TYPES OF THESE FITTED TO 200 TDI DISCOVERY'S, THIS IS THE TYPE WHERE THE END OF THE AIR FILTER FORMS THE CAP FOR THE HOUSING. RANGE ROVER EVOQUE L538 AUTOBIOGRAPHY. REMOVED FROM RANGE ROVER EVOQUE L538 2017 FACELIFT AUTOBIOGRAPHY 4WD 2.0 DIESEL AUTOMATIC GEARBOX IN WHITE. This listing is for a used part This Snorkel And Air Box is from a 1994 Discovery 1 300TDI Used condition, with marks and wear. I would advise resealing air box. As shown in photo. MGZT, ZS / Rover 75. 2.0 & 2.5. Recently removed from a2003 MGZT 2.5 Litre engine which we are currently breaking for spares. Clean checked and tested. Operates efficiently and functions without problems. Land Rover Defender 90 110 TDi Air Cleaner Decal Label Badge Information ESR2102. MGZT, ZS / Rover 75. 2.0 & 2.5. Recently removed from a2003 MGZT 2.5 Litre engine which we are currently breaking for spares. Operates efficiently and functions without problems. Land Rover made two Range Rover Models in 1995. The Range Rover (Classic or LWB) model has round headlights, and the Range Rover (4.0 or 4.6) model has square headlights. This part will "NOT" fit a Range Rover (Classic or LWB) model. MGZT, ZS / Rover 75. 2.0 & 2.5. Recently removed from a2003 MGZT 2.5 Litre engine which we are currently breaking for spares. BREAKING FOR PARTS LAND ROVER DICOVERY 4 SPORT L319 3.0TD V6 AUTO 256BHP ONLY COVER 67K 2014. SECURITY MARKS. MAKE SURETHE PART NUMBER MATCH WITH YOUR OLD PART. Reproduction Parts Decal Label Land Rover STC3519. LAND ROVER RANGE ROVER P38A AIR BOX - AIR INTAKE FILTER BOX. WE ARE AN INDEPENDENT LAND ROVER REPAIR AND PARTS CENTRE. WE HAVE A WIDE RANGE OF GOOD QUALITY USED PARTS AS WELL AS NEW FOR DISCOVERY, RANGE ROVER CLASSIC AND DEFENDER PARTS. This listing is for a genuine Land Rover used part This Air Box and Air Flow Meter is from a 2010 Discovery MK4 (LA) Some marks from use. RANGE ROVER L322 4.4 PETROL AIR FILTER BOX. 2004 RANGE ROVER L322 4.4 VOGUE. ALL OF OUR VEHICLES ARE RIGOROUSLY CHECKED BOTH VISUALLY BY OUR TRAINED STAFF AND ALSO ELECTRONICALLY USING THE LATEST SNAP-ON DIAGNOSTIC TECHNOLOGY. LAND ROVER DISCOVERY BONNET IN GREY REMOVED FROM 3.0 TDV6 2014. Once the above has been completed a full 100 Point Health Check is conducted of the vehicle, which comprises of the following Fluid checks including power steering/Anti-freeze/window screen wash/oil levels. This listing is for a used part This Air Filter Housing is from a 2004 Range Rover MK3 (LM) Please match current part number of 137176U5329 as shown in photo Good used condition. Removed from petrol 4.4 V8 L322 02-06. RANGE ROVER AIRCLEANER BOX DRIVERS SIDE BOX. AIR FLOW SWITCH EXTRA COST ' PART NUMBER IS CPLA-9600-DA. Genuine Rover in good clean used working condition. ITEM IS AS SEEN IN IMAGES.THIS ITEM OPENS AND CLOSES FROM THE BACK AND HAS A COUPLE OF SCRATCHES ON IT. FINDING CODE :73717. ITEM IS IN VERY GOOD CONDITION WITH FEW. REMOVED FROM A 2007 RANGE ROVER 3.6 TDV8 VOGUE. LMT CAR PARTS. Specialising in used car parts. 2002 - 2006 Range Rover L322 4.4 V8 Mass Air Filter Housing. We are a bonefide 'End Of Life' Vehicle Dismantlers situated in East Devon. We willALWAYS resolve your issue but would ask that you call us in order to do so. 2002 - 2004 Land Rover Discovery 2 TD5 15p Air Filter Box / Housing. We are a bonefide 'End Of Life' Vehicle Dismantlers situated in East Devon. We willALWAYS resolve your issue but would ask that you call us in order to do so. RANGE ROVER EVOQUE L538 2.0 DIESEL. REMOVED FROM RANGE ROVER EVOQUE L538 2017 FACELIFT AUTOBIOGRAPHY 4WD 2.0 DIESEL AUTOMATIC GEARBOX IN WHITE. ALL OF OUR PARTS ARE SECURITY MARKED TO SAVE ANY MISUNDERSTANDING. This listing is for a genuine Land Rover used part. This Air Box Mounting Bracket is from a 1999 Defender 110 Some surface rust as seen in photo. MGZT. Rover 75. Freelander. V6. 2.0. 2.5. Air filter box. (PHB102451) used. IT HAS BEEN REPAIRED WITH A QUALITY SUPER GLUE AND IS AS GOOD AS NEW. Fitted to V6 models EXCEPT the 190. Rover 200 air cleaner filter box petrol. Genuine Rover in good clean used working condition. We are currently breaking P38, L322 and Sport. LAND ROVER FREELANDER TD4. From A 2001 51 Reg. Air Filter Box Cover.